There are 2.3 million data science jobs in the U.S.
IBM predicts that number will grow 28% by 2020. You could write your data scientist resume in COBOL and get the job. Right? Well, yes, except for all those smart people. They're battling it out like League of Legends players for the top few unicorn jobs. You know, the jobs with a full year of paid paternity leave and $200,000 salaries. To land those jobs, your data science resume must stand out like DJ Patil at a Chuck E. Cheese. A data scientist resume example better than 9 out of 10 other resumes. How to write a data scientist resume that lands more interviews. Tips and examples of how to put skills and achievements on a data science resume. How to describe your experience on a resume for data scientists to get any job you want. Data Scientist Resume Example - See more templates and create your resume here. Your job is pulling golden needles from fields of haystacks. Your data scientist resume must be the needle, not the haystack. Pick a trusted layout like reverse-chronological. It's the best data science resume format. It puts your most recent work achievements first. Use clear fonts like Cambria or Arial. Delineate them with big headings. Add white space to avoid that "drowning in data" feeling. Last, save it as a PDF. Data scientist resume PDFs stay clean across machines. MS word resumes can corrupt in transit. Pro Tip: While PDFs are best, check the job description first to make sure they aren't outlawed. Always choose the format suggested by the job posting. Come with me. We'll sneak into the recruiter's office. Her name's Beth. Mmm. Looks like she's having cheesecake factory for lunch. She's also buried in a pile of 300+ data science resumes. Yours is in there somewhere, like a key fact in a spreadsheet with a billion rows. Catch the recruiter's eye with a data scientist resume summary or a resume objective. A resume summary is for data scientists with petabytes of experience. It uses that experience to prove you fit the job. A resume objective sells your skills and passion. Write one if you're basically like Ultron: new and powerful. Let the following data science resume examples be your guide. Data scientist with 9 years experience seeks new position. Skilled in statistics, machine learning, critical thinking, and data visualization. That's actually not terrible. You could qualify for a lower-tier data engineering job with that. 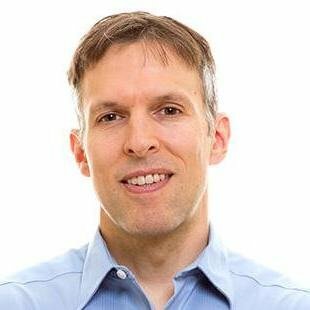 Microsoft and Google certified data scientist with 9 years of experience. Seeking to increase data efficiency for Contranix Capital Inc. Achievements include creating data regression models to predict company stock prices with 25% more accuracy than historical average. Achieved 20% improvement in investment returns across all clients. Highly skilled in machine learning, data visualization, and creative thinking. Kerpow! You just went from average to Andrew Ng. All you had to do was add some measurable accomplishments. Don't have much experience? Check out our next two data scientist resume examples. Most experts say a resume objective should show passion and skill with no experience. But if you've got experience, flaunt it, or you'll easily get beaten out. Entry-level data scientist, seeking a machine learning or data engineering job. No real-world experience yet but I'm eager to get into the Big Data field. That drops the ball like conflating correlation with causation. Junior data scientist with 3+ years of experience in project work and freelance jobs. Beat 200+ statistics professors and big data professionals in an NCAA pool, by building models that fit the problem best. Skilled in machine learning, statistics, problem solving, and programming. Remember Beth? Our faithful recruiter? She wanted proof that you could do the job. That junior data scientist resume example just gave it to her. Pro Tip: Participate in Kaggle challenges online. Some pay in cash prizes or job interviews. Plus, you can list any wins on a resume for data science positions. You can basically concoct a Bayesian neural network during snack time. But the hiring manager won't know that unless you prove it in your data scientist resume. So, don't just show experience. Show the right parts of the right experience to get the job. Start with your most recent position. Add 3–5 bullet points with measurable accomplishments. The next two data analyst resume samples show how to do it right (and wrong). Fulfilled all data science duties for a high-end capital management firm. Created and presented models for potential holdings to fund managers. Achieved 20% better returns vs historical performance. Created machine learning tools that computed adjusted P/E values. Predicted stock price 25% better than traditional figures. Now that’s a data scientist resume indeed! The recruiter just forgot what "quantile" means. Your well-engineered data science job resume just blew it from her mind. Worked as a data scientist for a capital management firm. Created and presented models for potential holdings. Created machine learning tools to compute adjusted PE values. Like an empty data set, that lacks details. You must show proof to get the recruiter to stop skimming. But what if your experience is null? 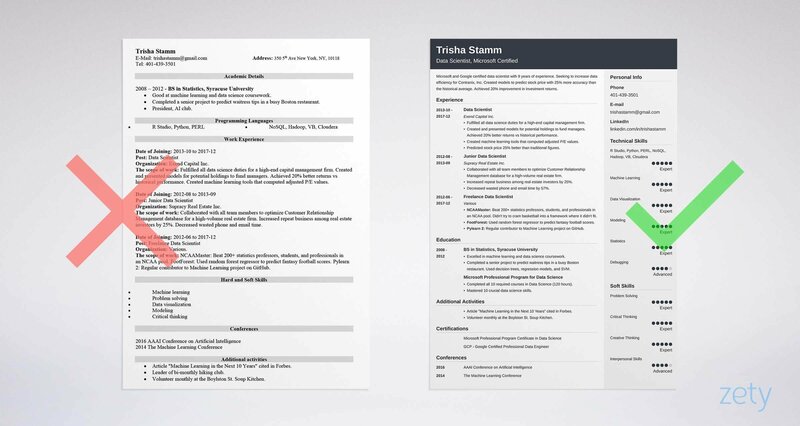 If that's you, check out the following fresher data scientist resume examples. Don't have experience? Get a little, fast. Do a couple Kaggle challenges. Take on some freelance jobs through Upwork. Contribute to some open source projects on GitHub. You can even just do data science projects on your own time, or list the ones you did in school. They won't take years or even weeks. Even so, they'll make a machine learning resume stand out like Corinna Cortes at a NASCAR race. These two data scientist resume examples spotlight the correct approach. Data Scientist Experience: No real world experience yet, but I'm very passionate. You might as well just say, "Mongo only pawn in game of life." NCAAMaster: Beat 200+ statistics professors, students, and professionals in an NCAA pool by finding the right data models for the job. FootForest: Used random forest regressor to predict fantasy football scores. Pylearn 2: Regular contributor to Machine Learning project on GitHub. Boom. You went from zero to the next Tim O'Reilly with a couple days of work. Almost anyone can make a good data scientist resume like that. Also check the Kaggle job board, Indeed, DataJobs, and Triplebyte. Look for jobs with startups on the HackerNews and AngelList. Remember, there are tons of data science jobs out there, with almost 30% more by 2020. Pro Tip: Don't just pick any old achievements or skills for your data scientist resume. Match your bullet points to the job description like WEKA to a massive data set. Education matters more for entry-level data scientists. But even a senior data scientist resume can use it as a springboard to get hired. Then tie it to the job offer like probability to p values. Both of these sample data scientist resume clips target the same job. It values statistics, machine learning, data regression, and AI. Excelled in machine learning and data science coursework. Completed a senior project to predict waitress tips in a busy Boston restaurant. Used decision trees, regression models, and SVM. Completed all 10 required courses in Data Science (120 hours). Mastered 10 crucial data science skills. That's no mere data scientist. It's Sandy Pentland in disguise. It plugs into the job description like a NoSQL query. Not so the next of our data science resume examples. That's the hello world of resume material. But sprinkle in those details, and you're back in Daphne Koller mode. Pro Tip: Should you add your GPA to a resume for a data scientist? If you're a recent graduate, you sort of have to. If not, only add it if it's impressive. Let's sneak up behind the hiring manager again. Yet no one proves a word of it. So how can you list skills without flunking the Turing test? Our next two data science resume examples explain. Data Science Skills: Collaboration, CRM, Database Management, Data Visualization. So, add them to your resume. But don't stop there. Collaborated with team members to optimize CRM database for a high-volume real estate firm. Decreased wasted phone and email time by 57%. Used matplotlib to create real-time ROI graphs that helped the teams focus on high-profit business. This led to a 20% increase in annual profit. That ties skills to achievements like Spark to Zeppelin. Use the skills below to launch the process. Let's get you up and running with a list of data science skills. Add to it from data scientist resumes on Indeed and other online sources. Use the plan above, and your data science resume will have you scoring Google/Yahoo/Splunk type jobs in no time. Pro Tip: Don't overfit your skills to the job description. Toss in a few they didn't ask for. Let's get back to Beth, our hiring manager. She likes certifications on her data scientist resumes. They're not the holy grail, but they do prove a base level of competence. But not if you hide them in a wall of words. Got a certification that features prominently in the job description? Add it to your name. Plus, put it in your job summary, and in a certifications section. The big data field serves up lots of certifications. One of the most prestigious is Microsoft's. It's a 120+ hour comprehensive course. Don't have a certification? Don't fret. What matters most is your experience, and how well it fits the job requirements. Pro Tip: If you land the interview, get ready for some FizzBuzz problems. Review topics like recursion, arrays, graphs, and stacks. Do lots of practice problems too. Think of your resume like a great data visualization. The data it needs to visualize is you. It has to show you're more than just experience and education. In other words, you're great to work with. Show that with "other" sections that share your depth and passion. The next two data science resume examples light the way. I hold several records in World of Warcraft. I make an amazing brisket. What's wrong with WoW and brisket? Nothing! But do they make you a better data scientist? That's a Norvig-worthy "other" section. Even the volunteering and the hiking help. They show leadership and service. You can add GitHub and other projects, too. Yet anyone can make a data scientist resume like that. Pro Tip: Need more recruiters to impress with your great data science resume? Start answering questions on Stack Overflow. Hiring managers use it to recruit. Recruiters do read data scientist cover letters. So why do "experts" say they don't? Because no one reads "Here is my data science resume" type cover letters. Smart candidates use that space to get a resume read carefully. First, make it personal. Use the hiring manager's name. Second, show your passion for this data science job. Third, show specifically how you can help. Finish with a request. "Can we set up a call to talk about improving [METRIC XYZ]?" works great. Pro Tip: Do you need a masters degree in data science to get a job? No. In fact, a bachelors in math, business, or even political science looks good on a resume for data science. If you're like most, you'll make one huge mistake with your data science resume. It's in your contact info. You probably even know a "professional email address" isn't something like happysillydragonballzplayer23498234@yahoo.com. For some reason, nobody wants to hire that guy for data science jobs. But did you know a LinkedIn profile and data science portfolio are even more important than a resume? About 87% of recruiters hire from LinkedIn. A personal portfolio site helps too. It can share so much more than a data science resume. Where to put GitHub on resume? You can add your GitHub profile to your contact info, too. Put it near your LinkedIn address. That works especially well if you've got an impressive body of GitHub work and projects. Pro Tip: Not sure how to write a great data scientist profile on LinkedIn? We've got you covered. Check out our guide on LinkedIn profile excellence. Read the job description carefully. Each bullet point in your data science resume should point back to the job offer. Don't just list your skills. Taylor them to fit the job with measurable accomplishments. 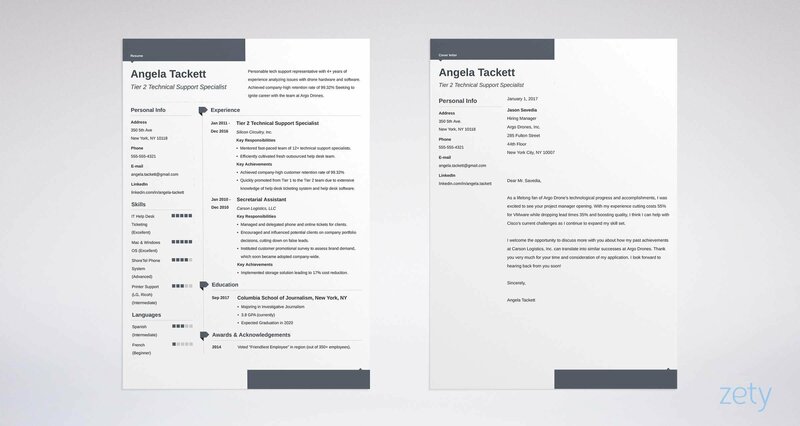 Add "other" sections to make your resume stand out like a machine learning resume by Daphne Koller or Adam Coates. Do you have questions on how to write a great resume for a data scientist? Not sure how to describe your skills or achievements? Give us a shout in the comments! We love to help!